I might have a drop or two of Irish blood in me... somewhere. My Scottish family moved to Ireland and then onto Nova Scotia. That's on my Dads side. My red hair is actually courtesy of my mom's Russian roots. But I'll always celebrate St. Patrick's day like any good Chicagoan. So a bit of luck to you today! 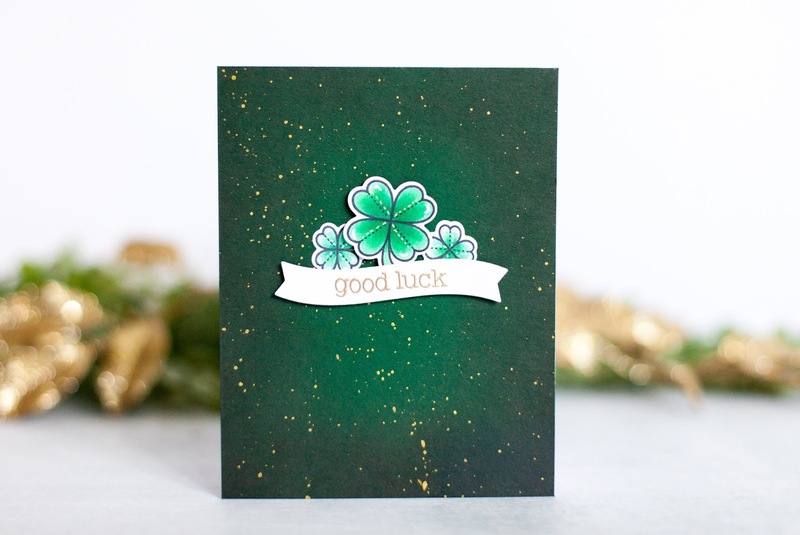 For the card I used Black Soot Distress Ink blended onto a forest green cardstock panel and splattered with Gansai Tambi Starry Colors in the color yellow gold. I heat embossed the sentiment with Lawn Fawn's Gold embossing powder onto one of the new Fancy Wavy Banners. The shamrocks are from an older Lawn Fawn set My Lucky Charm.